This is part 4 of the Freelap Friday Five Series, 2013 Edition. To review the 16 part 2012 edition, click here. When I first met Mike Hurst over 10 years ago, I knew him as a 400m track coach unaware he was also the Journalist with the same name. 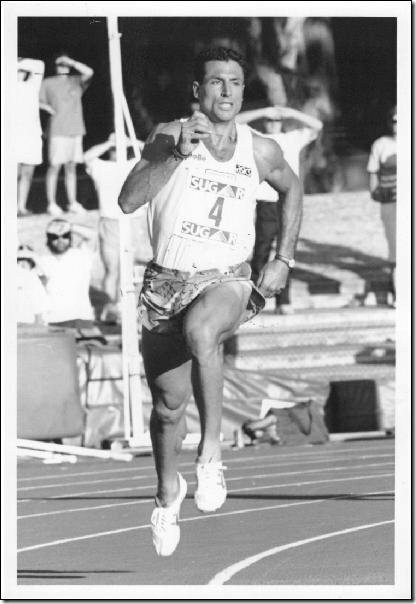 As a coach, Mike coached Australian sprinters to qualify for five consecutive Olympic Games (1980 Moscow to 1996 Atlanta). Two of his protégés, Maree Holland and Darren Clark, set Australian records and were 400m finalists at the 1988 Seoul Olympics (more on Darren in Question 3 below). Mike is also a 2-sport coach with formal coaching qualifications in Athletics and Basketball. As a journalist, he covered 6 Olympics (1984-2004), 9 World Champs (1983-2003), and 7 Commonwealth Games (1974, 1982-2002). He recently retired being with the Daily Telegraph since 1978. Mike is a past president of the Olympic and Commonwealth Games Writers of Australia (OCGWA). He was Area representative on the Association International Press Sportive athletics commission from 1983 to 2003 and was Vice President from 1999 to 2003. NOTE: In Question 1, we reference the Lactic Acid Tolerance Training 332 page ebook which is an excerpt of seven year’s worth of discussion from the Charliefrancis.com forums, available on Amazon Kindle. You can also convert kindle to PDF or any other digital device using 3rd party software. Q1: I like to talk about the Concurrent Theory or Concurrent Design training program. On this blog, we talked about short to long, and long to short, but I have never mentioned short AND long (i.e. concurrent). Recently when I published the free Jamaican Sprint Secrets ebook, Stephen Francis (Asafa Powell’s coach) uses a similar concurrent training plan. (I attached a sample excerpt of your training philosophy from the Lactic Acid Tolerance Training Kindle ebook). Would you use this for all athletes? Are there cases where short to long, long to short, or concurrent are better than others? Mike Hurst: There may be athletes who would prefer short to long or long to short, perhaps because their season is compressed leading into an indoor campaign early in the year. But honestly I think the principles which underpin the concurrent model make sense and apply to all athletes. The simple idea of quarantining one or two days per week for rest and regeneration followed by a high intensity day to be followed by a low intensity day is only logical to me at least. I think the concept has validity for athletes in all events, from 100m to the marathon, from hurdles to throws. Q2: On Program Design. There are many ways to design a program. I like the alternating 3 days a week for hard sessions (MWF) with easier tempo days on 2 or 3 days a week (Tue, Thurs, Sat optional). Another method I use is hard sessions Mon, Wed, Fri, Sat. Note the Fri/Sat are back-to-back sessions where Fri is speed and Sat is special endurance (diff energy systems). Can you tell us how this evolved? Looking back, would you change anything, other than varying work volume to different athletes? Mike Hurst: It evolved because I was coaching two world top-8 400m runners – Seoul Olympic 400m finalists Darren Clark and Maree Holland – who had precious little funding support for massage or other therapy. There was the Australian Institute of Sport where such rehabilitation was lavished on scholarship holders but both of these particular athletes wanted to stay in Sydney with me. Both had also travelled the world and competed extensively on the then Mobil Grand Prix and they believed some (many?) of their opponents were using PEDs which seem to work primarily be accelerating recovery and therefore adaptation after exercise. Ethically PEDs were out of the question even if they were affordable, which they were not because both my athletes were coming off pretty miserable seasons in 1987 when training with other coaches at that time. I remember Dr. Jamie Astaphan suggesting to Darren and me in Cologne in 1988 that Darren would benefit from a course of hGH to recover from a hamstring problem. We asked how much and he said US$1000 a vial which he could provide. It was an unreal conversation. I couldn’t believe what I was hearing from Ben Johnson’s doctor on tour. But we laughed it off because the stuff was banned and completely unaffordable to us. In any event the dye had been caste already in late 1986 when I set about to re-think everything I had been taught in coaching courses about program design. I thought a lot about my own philosophy of coaching which distilled down to a belief that the quality of contact with the track determined everything to follow, step by step. 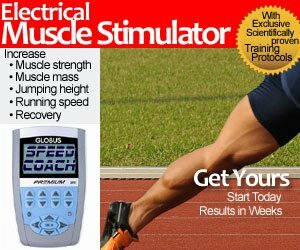 That led logically to a need to pay more than lip service to the word “specificity” and its application in training obviously from a biomechanical perspective through to consideration of what made sense in a practical application of what we knew about energy systems, neural fatigue and muscle fibers requiring 48hrs to fully re-set. One of my earliest and most influential mentors was Kelvin Giles. I also listened a lot to north American coaches Charlie Francis and Loren Seagrave who spoke about the development of maximum velocity (and therefore ultimately speed-reserve) which was more of a neural approach to coaching sprinters. And I learned what was possible in program theory and to be adventurous in program design. So I felt that after I had arrived at a philosophy of what was imperative in coaching the sprints that if I was true to that philosophy the results should follow and, up to a point, they did. Maree ran a season best of only 55sec in 1987 and when Darren came to me in early 1988 (after finishing last in his semi at the Rome world championships) he put in five weeks training and was still so unfit he ran 47.1sec and lost a race in New Zealand to an Auckland schoolboy. But in the wrap up in Seoul, both Darren and Maree reached their respective Olympic 400m finals clocking Aussie national records of 44.38 and 50.24 in their semis. Those times remain respectable, even more so in the current climate. Q3: Under your training, Darren Clark’s 44.38 (set in 88) is *still* the National record, and he placed fourth place in two consecutive Olympics, 1984 and 1988. What does that say about the state of 400m in Australia? Are they coaching them wrong (joking here)? Are kids focusing on the money-and-glory events? (i.e. 100 meters, the Mile, the Marathon) Jamaica has this similar problem with everyone trying for the 100m, and don’t want to put in the work required for 400m… a vague understatement, I know . Mike Hurst: I think Australia has some great 400m coaches. Darren PB remains the national record a quarter-century later, but Maree’s 50.24 was also the NR when she ran it although Cathy Freeman eventually obliterated it with her 48.6sec in Atlanta 1996. Peter Fortune coached Cathy most of her career. Australia’s men won silver medals at the 2004 Athens Olympics despite losing two of our best guys to injury during the Games. We had depth, lots of different coaches contributed to putting silver on the table. Yet immediately after Athens the regime in place at that time at our NF, Athletics Australia, took the expedient option to a funding crisis by sacking – excuse me, not renewing – the employment contracts of all 18 fulltime coaches in our system including the excellent head coach and high performance manager Keith Connor. Last year a Sydney sprinter, Steve Solomon, took bronze in the world junior championship 400m and then dipped under 45sec in reaching the London Olympic final less than 12 months after a very serious hamstring tear during a school carnival. His coach, a Ukrainian woman Fira Dvoskina, nearly 80, did a magnificent job coaching Steve but so too the various medical staff. Some of the physiotherapists and sports doctors who treated Darren all those years ago are still working today and their knowledge is world-best. Q4: Kevin Moore is a success story, and recently made headlines by working with controversial coach/athlete John Steffenson. Can you tell us how you discovered him (along with the NSW Institute of Sport 400m Fast Track project), and the type of training that led to his 4x400m Gold medal at the 2010 Commonwealth Games in Delhi? What was his PB under your guidance? Mike Hurst: The New South Wales Institute of Sport based within Sydney Olympic Park at Homebush was the last of the State institutes of sport to come into operation back in late 1996 or maybe early 1997. 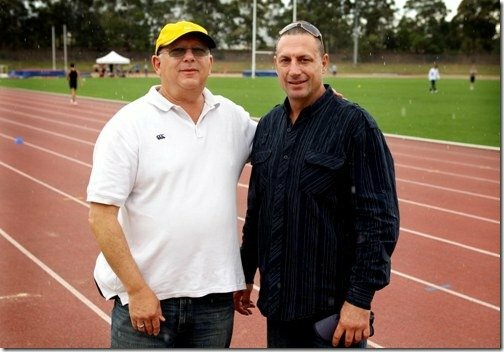 In 2009 NSWIS CEO Charles Turner, a famous Olympic waterpolo player in his day, phoned me and said they were thinking of setting up a 400m development program and wanted to establish a coach mentoring system. I had not personally coached an athlete since the 1996 Atlanta Olympics when I guided Kylie Hanigan to run the fastest split (51.2) in Australia’s ill-fated 4×400 the day after she had run a flying 10.5 on the backstraight in the 4x100m Final. I jumped at the chance to be involved in the NSWIS400 Fast Track program although it was an honorary position. At that time I was still employed by News Ltd as a sportswriter, sub-editor and online producer based at the Sydney Daily Telegraph so the question of money didn’t concern me as I had always been a hobby coach. The NSWIS got right behind the 400 Fastrack program and appointed three-time Olympic long jumper Nicole Boegman Stewart as administrator. She organised a big meet-and-greet in the stylish Ian Thorpe Theatrette and we had a large turnout of interested coaches. Those who eventually signed up though were people who had never had significant success coaching athletes for the 400m, or those who had never tried and though perhaps this might be the safest way in that direction. One of the coaches who probably fitted the latter category is Larry Spencer, a retired accountant from the Central Coast area an hour’s drive north of Sydney. He had a squad of good sprinters and hurdlers who he had developed very much in isolation from the elite scene through no fault of his own. Two of his squad were Kevin Moore and Matt Lynch, both 200m sprinters in the 21.2sec zone. They followed Larry’s advice and embraced the “concurrent design” concept and Lynch clocked 46.6 on debut beating Beijing semi-finalist Joel Milburn by more than a metre in late 2009. Lynch then almost immediately got seriously injured over training on his own while holidaying up north with mates. But Kevin stayed injury-free, dipped into the high 45sec zone and was picked as a travelling reserve for the Australian 4x400m at the Delhi Commonwealth Games. For reasons best known only to himself and his coach, the national 400m titleholder Ben Offereins ran out of puff by the time he had finished the individual 400m in Delhi and he was dropped from the final line-up for the long relay, his place taken by Kevin Moore who ran very well because his periodization had been successful and I guess his conditioning as a 200m specialist was appropriate to his progression to the 400m and an immediately pleasing result. Q5: Has Performance Therapy (massage, chiro, ART, etc) changed a lot in the past 32 years? Back in those days, a simple post-race (and the day before) rub down was all that was required. Now we have performance therapists on the track, during the warm up, constantly doing soft-tissue work and maintenance. And EVERYONE wants to jump in the ice tub after the workout. (don’t get me started on cryogenic chamber or cryogenic saunas!) Thoughts? Mike Hurst: Recovery is the key to quality. You can grind away at the endurance end of performance in any event but ultimately it will be the athlete’s ability to apply some real heat which will determine how far they go along the success tightrope. We know excellent is never far from injury, so therapies are important – particularly deep-tissue massage and joint adjustment whether by chiropractic /osteopathic or physiotherapy techniques. Form follows function so “switching on” idle muscles by whatever process, restoring normal muscle length often by restoring normal joint function are really important factors underpinning high performance. Unfortunately, even though the NSWIS400 Fastrack squad receive free chiropractic treatment by appointment with Healthspace Clinics across Sydney, no chiropractor or osteopath to my knowledge has ever been officially appointed to an Australian athletics team, much less an Aussie Olympic team. I enjoyed this article a lot. 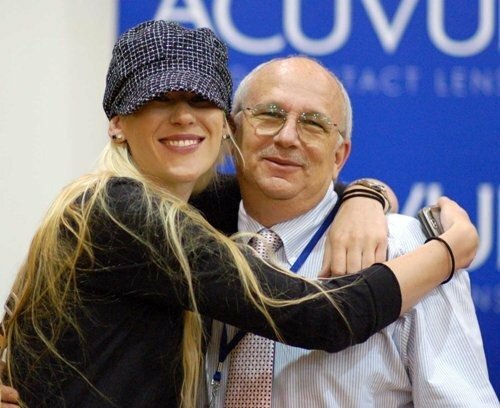 It introduced me to an excellent coach with whom I was unfamiliar. I like what Mike Hurst had to say. His coaching seems to be based on logic and common sense, rather than theories. It’s practical and obviously works. After ten years of coaching track & field, trying different things, reading a lot, and talking to many coaches at all levels, I have arrived at a program design and philosophy very similar to Mike’s. Like him, I use a concurrent program. Like him, I have a day off after two days of training, followed by three more days (two for very young athletes). Finally, I have been convinced after ten years, as Mike seems to be, that they key to success in the longer sprints (including the 800m) is the development of speed reserve in conjunction with lactate tolerance. The difficulty I often have is convincing 800m runners that they will benefit more from increasing their speed than they will by putting in more mileage. It’s also frustrating to see good US colleges like Harvard and Columbia basing their 800m training on mileage alone, with no speed work to speak of. The results are what you would expect–aerobically fit athletes who can’t run fast. Why are they still doing this? Hello Jimson, I had a quick question on the difference between Specific and Special endurance workouts. I read the attached PDF, “full sample week of your training ” and Mike Hurst defined his 6x200m race modeling workout (incomplete 2min recovery) as a Specific Endurance workout. While in other documents posted, (specifically, “Classifying Sprint Training Methods” by Michael Khmel) they state that Specific Endurance workouts are done with FULL recovery and Special Endurance are done with incomplete recovery. I feel as if I do not fully understand the difference, and am curious what you define them as. really race but also so as to achieve the significant benefits of speed reserve. Footnote: Over lunch with Steve Cram and Darren Clark many years ago now, Crammy offered the observation that all the top milers and half-milers of the golden age of British athletics -Sebastian Coe, Steve Ovett, Steve Cram, (& Peter Elliott ?) – all trained with 400m squads for their interval work because it forced them to learn how to sprint in the first instance and to sprint under fatigue which is what David Rudisha gave a demonstration of in the Olympic final last year. Jack it’s just semantics. As the British used to say of the Americans “we are divided by a common language”. I call the 6×200 with 2min recovery set/session “specific endurance” because in my own understanding and therefore terminology running continuous 200m aqt 23sec for Darren Clark (or 26sec for Maree Holland) was specific to the models recognised for a 44.0sec 400m and a 50.0sec 400m for females. But you can call it what you like. As long as you as the coach and your athletes know what you want and how to get it then you can create your own vocabulary and if you’re successful enough I bet everyone will swing across to use your own terminology. lol.